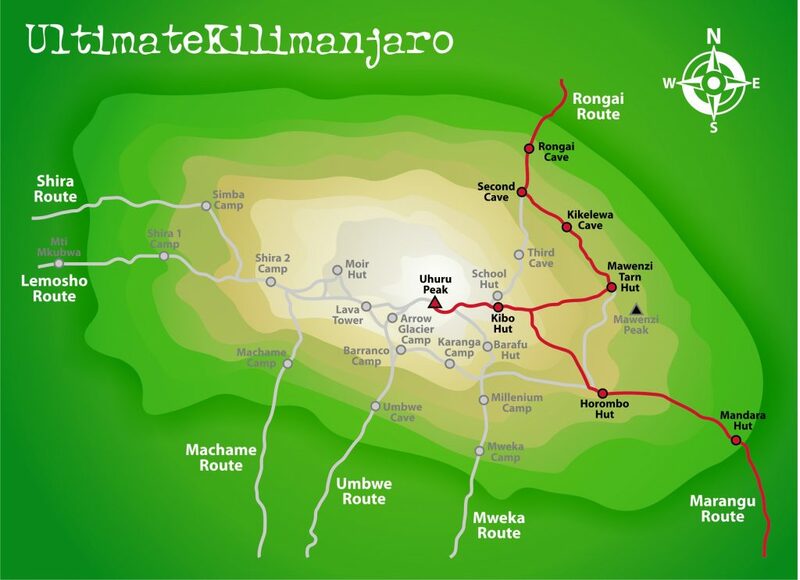 The Rongai Route is the only route that appraoches Kilimanjaro from the north, near the Kenyan border. Rongai’s ascent profile is very similar to that of Marangu. 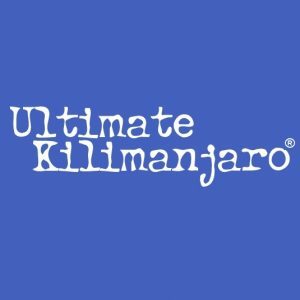 It is one of Kilimanjaro’s easier routes. The climb to the top is gradual and steady. 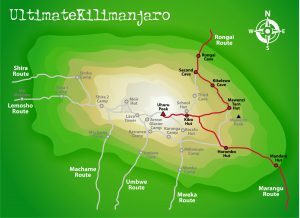 However, unlike Marangu, this route has low crowds and passes through remote wilderness areas. It is probably the only route where seeing wildlife in the first days is possible. 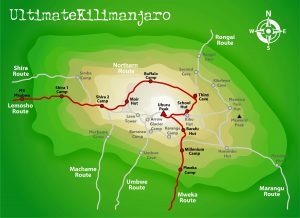 Below is a map of the Rongai route on Kilimanjaro. Scenically, Rongai is beautiful because it travels through an unspoiled rain forest and remote wilderness area. However, it is not as scenically varied as Machame, Lemosho and Shira. Rongai is ideal for those who are not confident in their ability to hike over steeper paths, those who want to avoid traffic, and those who want to enjoy a quieter hike. It is also preferred when climbing during the rainy season because the north side of the mountain receives less precipitation. We drive from Moshi to Marangu Gate for permits before taking a short transfer to the Rongai Gate trailhead. The path winds through corn and potato fields and then climbs gently through the forest which is home to a variety of wildlife, including the black and white colobus monkey. We begin this morning with a steady incline up to Second Cave. We continue trekking though moorland, leaving the main trail for a smaller path towards the jagged peaks of Mawenzi, before finally arriving at Kikelewa Cave for the night. The hike today is short and steep up a grassy slope. Views of the wilderness area are stunning. As we exit the heath zone and emerge into the Alpine Desert zone, the landscape changes dramatically. Our camp is situated beneath the jagged spires of Mawenzi, at Mawenzi Tarn. The remainder of the day can be spent relaxing or exploring the area. This is an extra day meant for acclimatization and can be spent day hiking on Mawenzi Ridge. The unique landscape offers motivating views of Kibo and Mawenzi. After spending a few moments exploring the area we head back to Mawenzi Tarn for camp. 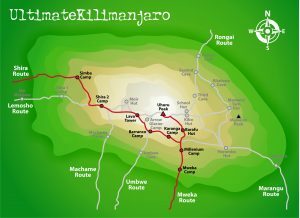 We climb gradually, then cross the lunar desert of the “Saddle” between Mawenzi and Kibo. Our camp, Kibo Hut, sits at the bottom of the Kibo crater wall. Once here we rest, enjoy an early dinner to prepare for the summit day. After spending a few moments taking in the plains of Africa and your accomplishment, we descend to Horombo Hut. Later in the evening, we enjoy our last dinner on the mountain and a well-earned sleep. On our last day, we have a long trek mostly downhill through the tropical rainforest. Once at the park headquarters at Marangu gate, we collect our summit certificates. A vehicle will meet us here and drive us back to the hotel in Moshi.